A unit trust fund is a vehicle which enables individuals, corporations and institutions that have common investment objectives to pool their money. Professional fund manager then use this pooled money to acquire investments they consider will help meet those objectives. These investments are collectively referred to as the fund’s assets. 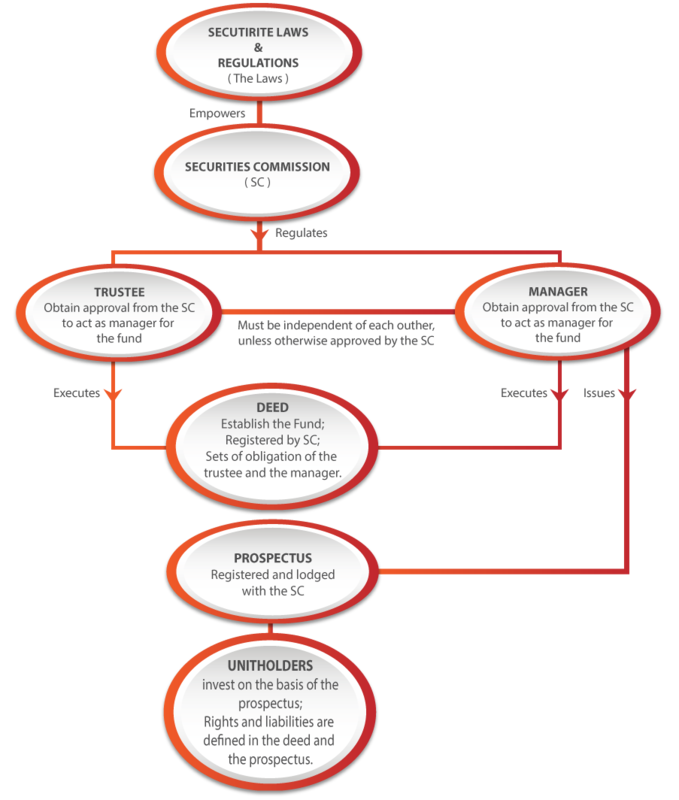 As a safeguard for investors, the manager is not allowed to hold the fund’s assets in its own name instead, a trustee is appointed to act as custodian of the assets. a unitholder – who invest money in the fund by buying units. a trustee – who is required to use due care in protecting the unitholders’ rights and interest. 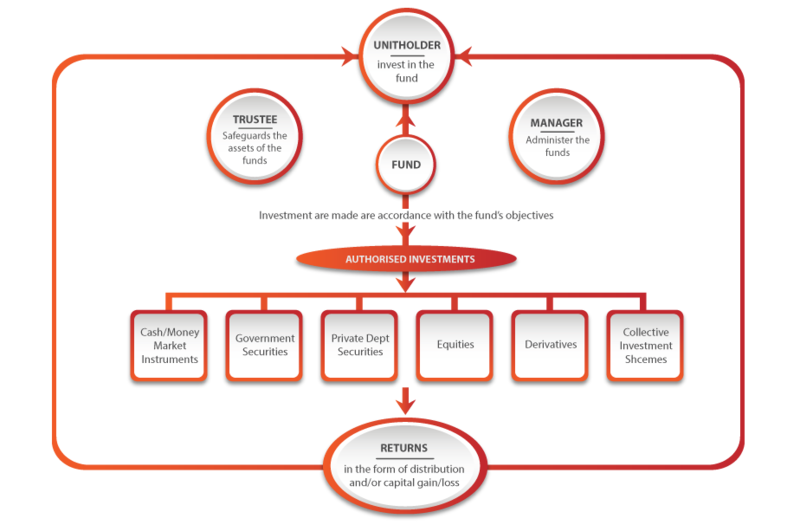 The fund’s assets are held by the trustee and the trustee receives all income from those assets. a manager – who is responsible for setting and implementing the investment strategy and is also responsible for the proper administration of the fund. 2. How are unit trusts being regulated in Malaysia? 3. Can I switch from one fund to another? Switching is allowed between funds managed by Amanahraya Investment Management Sdn Bhd subject to a fee. Please refer to the fund’s respective prospectus for more information. 4. Am I allowed to transfer my fund units to another person? Transfer of the fund units is allowed at the Manager’s discretion, subject to a fee. Please refer to the fund’s respective prospectus for more information. 1. Who is eligible to invest? An individual who is not an undischarged bankrupt. The applicant must be 18 years of age and above. The first named applicant must be 18 years of age and above. The joint applicant can be of any age. Companies, co-operatives, societies, sole proprietors, institution, etc. 2. What is the minimum investment required? The minimum additional investment is RM100 or such amounts as the Manager may from time to time decide. 3. What forms do I need to complete? 4. What are the documents to be attached? Any other relevant documents as required by the Manager from time to time. 5. What are the available payment modes? Applicants are to write their names and NRIC numbers at the back of the cheque, draft or money order. You can either mail the application with complete documentation and payment to us or give it to any of distributors for delivery to us. If we do not receive complete documentation with the payment, we reserve the right to reject the application. If you deposit payment into our account and do not notify or provide us with the complete documentation, we shall reject your application and hold such amount until claimed. Note: Where payment is by cheque, the cheque must be issued by the investor. Third party cheque payment must be accompanied with a properly signed letter from the issuer of the cheque stating that he/she is aware that the cheque is used for investment in unit trust by the investor duly named in the case of bank draft or money order, a copy of the application for the bank draft or money order. If the draft is applied by a third party, then a letter from the third party attesting to the use of the draft for the investment in unit trust by the investor must be submitted. Please send the payment, application form and other relevant documentation to us, or hand them to institutional unit trust agents for delivery to us. Please contact marketing department desk at Tel: (03) 2687 5200; Fax: (03) 2687 5300 should you need further assistance. You are advised to retain the bank-in slip issued by the bank for your record and future reference. Please do not mail cash. 6. How do I make an additional Investment? You are required to complete a Transaction Form and forward it with payment as done under Question 5 above. You may make regular investments in the Fund by giving your bank a standing instruction. These payments must be for a minimum additional investment amount and can be made at regular intervals such as monthly, quarterly, half yearly and annually. You are advised to notify us if you plan to make regular saving investment/autodebit plan in order to receive a copy of the latest Prospectus at each renewal date of the Prospectus to allow you to have update information of the Funds. You are also required to provide a copy of your bank pass book upon making regular saving investment/autodebit plan and deliver to us. For Cash Management fund, you will need to complete the necessary documentation available at the respective institution to transfer minimum additional investment amounts from your savings account to your funds account with us. You are advised to notify us if you plan to make ATM investment in order to receive a copy of the latest Prospectus at each renewal date of the Prospectus at each renewal date of the Prospectus to allow you to have update information on the funds. All investment made through the ATM will be processed at the close of the Business Day (forward pricing) the Manager is notified of the investment by the relevant financial institution. 7. What is the minimum additional investment required? Different funds have different minimum additional investments required. Please refer to the fund’s respective prospectus for more information. 8. When is the cut-off time for submitting an initial and additional investment request? Processing Ordinary Application If an application with cleared payments and complete documentation is accepted by us before 11.00 a.m. on a business day, it will be processed on the same business day. For EPF Investment Scheme If an EPF application with cleared payments and complete documentation is received before 11.00 a.m. on a business day, it will be processed on the same business day. If an EPF application with cleared payment and complete documentation is received after 11.00 a.m. or on a non-business day, it will be processed on the next business day. If an application with complete documentation and payment are accepted before 4.00 p.m. on a business day, it will be processed at the end of day (NAV per unit) of the same business day which will be computed in the next Business Day. If an application received with complete documentation and payment are accepted after 4.00 p.m. or on a non-Business Day, the application will be processed at the end of the day (NAV per unit) of the next business day which will be computed on the business day after the said next business day. Note: The Manager reserves the right to reject any application that is unclear, incomplete and/or not accompanied by the required documentation. Incomplete applications will not be processed until all the necessary information has been received. If an application with complete documentation and payment are accepted before 4.00 p.m. on a Business Day, it will be processed at the end of day (NAV per unit) of the same business day which will be computed on the next business day. If an application receive with complete documentation and payment are received after 4.00 p.m. or on a non-business day, the application will be processed at the end of the day (NAV per unit) of the next business day which will be computed on the business day after the said next business day. Note: The Manager reserves the right to reject any application that is unclear, incomplete and/or not accompanied by the required documentation. Incomplete applications will not be processed until all the necessary information has been received. The trustee’s obligation in respect of monies paid by an investor for the application of unit arises when the monies are received in the relevant account of the Trustee for the funds. 9. What are the advantage of regular savings / autodebit plan? Over the long term, this strategy helps to smooth out the volatility of the market. Other benefits include prevention from investing a lump sum during the worst market condition and eliminates the need for “market-timing”. 1. What is the minimum withdrawal amount and minimum holding? The minimum withdrawal amount of the Fund is 100 units or such amount as the Manager from time to time decide, unless you are withdrawing your entire investment. For EPF Unit Holders, the net redemption proceeds will be remitted to EPF for crediting into your provident accounts. The minimum holding/balance of units remaining in your account must always be 100 units or such amounts as the Manager may from time to time decide. If a redemption notice is received and the amount in your account is below 100 units, you will either need to make additional investments to meet the minimum balance required by the Fund or the Manager may redeem your entire holding of units in the Fund and forward the proceeds to you. 2. How do I make a withdrawal? You can make a withdrawal by completing a transaction form. A repurchase notice can take any of the following forms provided the terms and conditions for such repurchase notice are adhered to. 3. What is the manner of payment for withdrawal proceeds? No withdrawal will be paid in cash under any circumstances. 1. Will any entry charge and exit charge be imposed after I invest and withdraw my units respectively? The maximum Entry Charge of 1.0% on the NAV per unit shall be imposed on each purchase of units of ARUTF/ARSTF and maximum Entry Charge of 5.5% on the NAV per unit would be imposed on purchases of ARIEF. Investor may negotiate and at the Manager Discretion to charge lower service charge subject to qualifying criterion. 2. Please elaborate on the management fee and trustee fee that I may incur when investing in a fund? The annual management fee is to cover investment management and ongoing fund administration expenses, while the trustee is entitled to an annual trustee fee for acting as custodian of the fund’s assets and safeguarding the unitholders interest. 3. What are the charges for switching from one fund to another or transferring my investments to another person? Switching from ARUTF/ARSTF to other funds managed by the Manager may or not incur switching fee. Generally, no fees are charged on switching between funds that charge the same amount of fees unless the funds being switched to have different Service Charge. The fee charged will be based on the difference of the Service Charge between the fund to be switched from and the fund to be switched to. The minimum unit for a switch is 100 units. The minimum unit for a switch is 100 units. You need to keep a minimum balance of 100 units at all times or such amount as the Manager may decide from time to time. A maximum of RM50.00 may be charged for each transfer. You are allowed to transfer your unit holdings, subject to conditions stipulated in the Deed. The minimum transfer is 100 units. The Manager may refuse to register any transfer of units at its absolute discretion. 4. Are they any other fees and charges that I need to be aware of? All information and issues expenses of the Fund pursuant to this Master Prospectus will be borne by the Manager. 5. Please elaborate on Management Expenses Ration (MER) and its importance to investors? Make the first step towards reaching your financial goals. Let's begin your investment journey with us.